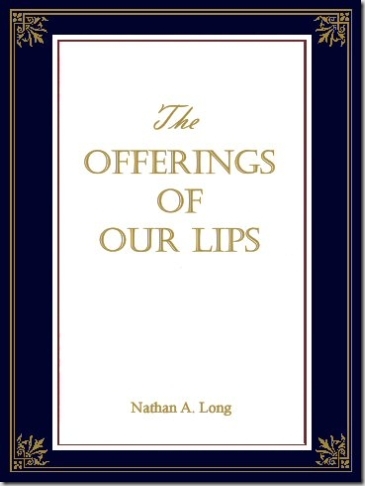 I feel like we’re getting a lot closer to being able to release The Offerings of Our Lips. Just today I finished what I think may prove viable as a front cover. But I’m interested in what you think. So…is it classic enough to be a prayer book, but interesting enough to catch someone’s attention? If any of you have graphics abilities, take a whack at designing a cover and email me. I’d love to see what you think this book ought to look like. If you would like a preview of the content, leave a comment to that effect, including your email address, and I’ll reply with a pdf of excerpts.